The Series 613 Double Hung mirrors the appearance of traditional double hung windows, with bold sash profiles. Both sashes can be hinged back into the room for convenient cleaning. Series 613 Double Hung windows give the solid appearance of timber with the all benefits of aluminium: strength, weather performance, sound reduction, high performance powder coat and anodised finishes, security and fly screening. The window has been tested for compliance with the relevant Australian Standards achieving a high water resistance of 300Pa. 102mm frame, mullion and transom have a soft 2mm internal radius. Both sashes can be hinged back into the room to allow cleaning of both sides of the glass from inside, without having to remove the fly screen. Sashes can be secured with the Vantage custom key or non-key locking cam handle. MAGNUM™ double-hung windows can be fitted with external flyscreens within the frame line, no turn buckles required. 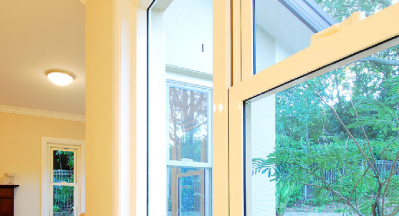 The window is compatible with the high performance Designer Series windows and doors. A large range of snap couplers allow windows to be joined at 90°, 135° and 180° without unsightly rivets or screws. Matching fixed sidelights/highlights and lowlights. 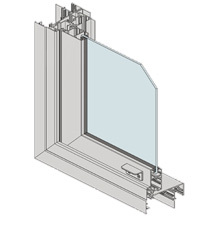 Sashes and sidelights will accept a variety of glass thicknesses from 4mm single panes to 20mm insulating glass units.